We had so much fun at our Biggest Loser Twitter party tonight, that we're offering a chance to win a special prize pack from MultiGrain Cheerios®! 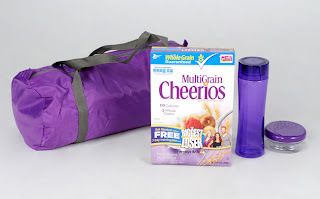 If you're not familiar with all the fun tools that the MultiGrain Cheerios site has to offer, here's your chance to learn more! Access to the site requires a code found inside specially marked boxes, and you can find your BMI, an exclusive 7-day plan that pairs daily meals with cardio and strength-training routines, tasty recipes, money-saving tips, and more! Wanna Win? We are giving away this fun prize to one lucky commenter. To be entered to win, just tell us your healthiest New Year Resolution! You have until January 15th at 11:59pm CST to get your entries in. One per person, please! Learn more about the benefits of MultiGrain Cheerios at their website! *I’m working with General Mills as a panelist for the MultiGrain Cheerios Twitter Parties. The prize pack has been provided by General Mills and MyBlogSpark. I enjoy walking, and am planning to do more of it...I've gotten out of the habit since we moved 4 months ago! I'm being very reasonable and have made a commitment to exercise a little more, and eat a little less. Also, making better food choices! I am resolved to eat healthy, colorful vegetables at least once a day.. I've been doing pretty good so far. We've started eating healthier by taking in more fruits and veggies, cooking more meals at home versus eating out and so much more! I've lost 10 lbs since the first! I'm resolving to lose 50 pounds and run a half marathon. So far I've stuck with it and am really pumped to keep going! I am resolving to last the last 40 pounds I need to lose. I am resolving to become healthier by both exercising and eating healthier. This includes getting my family involved as well. My new years resolution is not to lose weight quick, it's to do it the healthy smart way and keep it off for good. Grab a workout buddy and incorporate new routes, new routines in your everyday workouts to keep you motivated and interested. My goals are to make healthier eating habits, watch my portions, exercise more, and get a good nights sleep! I have been working out with our new Biggest Loser Kinect game! My healthiest resolution is to eat more fresh fruits and veggies. I would like to lose 50lbs this year. To drink lots of water and eat more veggies! My New Year's Resolution is to get back into my smaller sized clothes. I plan to do this by watching portions and exercising. When I'm getting fit, I can encourage my family to be more fit! Mine was to eat a bit healthier than last year (esp less sweets) and to move more. I am doing good on the first part and flunking the second. I resolved to up the number of fruits and veggies in our diet!